HOW CAN WE BRING OUR NURSING HOMES TO BE FUTURE-READY? One way is through making its internal processes more streamlined and efficient. Project IngoT II is a “sequel” to Project IngoT, a first-of-its-kind healthcare / eldercare enterprise system project in the region’s non-profit sector, with its inception, design and development revolving around a community model. Through a universally designed nursing home, the IT system is delivered through secured cloud computing/ hosting, and complemented with an empowering mobility experience. This transformation will ultimately help alleviate the burden of our eldercare sector which is experiencing a surge in demand for nursing home beds as the population of elderly soars. While the government continues to build more nursing homes to satiate the rising demand, IngoT II will help to strengthen the overall capacity and capability of existing nursing homes to help them address key challenges such as manpower shortage, paper-based patient progress tracking and records, error-prone manual order entry, laborious and time consuming billing, etc. WHAT IS INGOT II MADE UP OF? 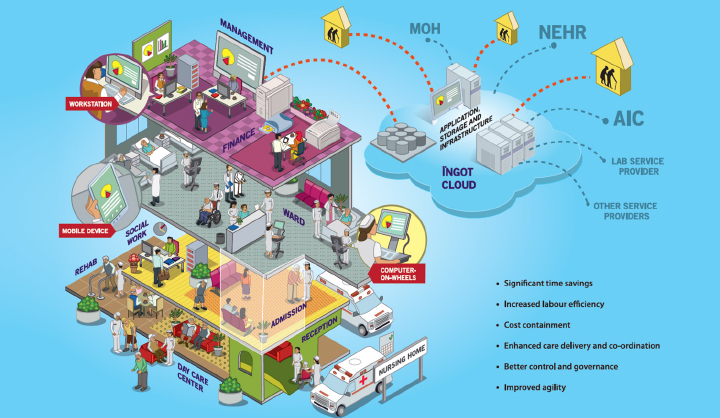 Developed by local healthcare IT vendor PulseSync, IngoT II uses a mix of several Microsoft technologies that is customized to enable nursing homes to have greater control and insights into their operations. Refer to IngoT Technology Overview and Infographics here. When completed, the project will benefit more than 1,800 residents in seven nursing homes or about one in five nursing beds in Singapore. Nursing homes in the programme include Ling Kwang Home for Senior Citizens, Man Fut Tong Nursing Home and Kwong Wai Shiu Hospital. WHAT ARE THE VISIBLE OR MEASURABLE BENEFITS? Nurse Winifreda Macatangay, who works at the 401-bed Peacehaven Nursing Home in Upper Changi Road North, said: "Medical instructions are no longer handwritten so we don't have to spend extra time deciphering doctors' notes and can act on them quickly." The home's executive director, Madam Low Mui Lang, added: "Now our nurses are freed up from many tasks, allowing them to better focus on residents and giving valuable person-centred care. 140 types of forms and reports have gone paperless."